We just received another update from Minor on the construction progress. There are just a few final touches to take care of in the coming days. This past Saturday the cabinets were installed in the kitchen and bathroom. They also installed the baseboards. 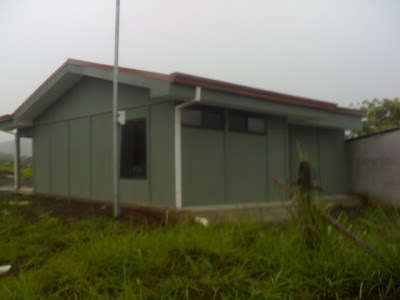 The exterior is now painted and the all the interior rooms have been painted as well. Here is a picture of the front of the house. Vinicio is standing on the right, next to the roll-down security door which will cover the front door and side windows when we're not there. On the left side you can see the garage door. 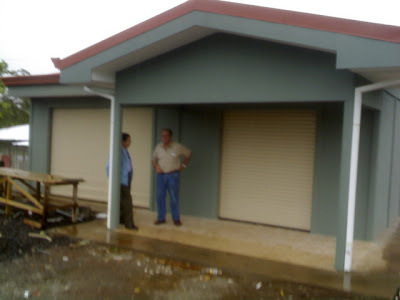 We elected to install a solid door instead of the more common wrought iron gates found on most Costa Rican garages. This offers a little more security for our extended absences. Here is a picture of the rear of the house. You can see the two bedroom windows in this view. They still need to install the interior doors, all the electrical fixtures, toilet, bathroom sink, closets and A/C. They also have some site prep work to do which will include the property access and fence. We are still on track to be there on July 4th and we are so excited that our daughter Jenny will join us there on July 10th. She is planning on staying in Costa Rica for an undetermined period of time to study more Spanish and if she has the opportunity, she would like to do some volunteer work. This will be a wonderful opportunity for her. Congratulations, you must be itchin' with excitement!! Bienvenido a CR (when you live here/have property here it's a brand new welcome)! !